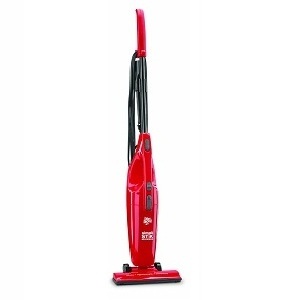 The Dirt Devil SD20000RED Simpli-Stik is a three-in-one machine that provides different vacuum cleaner functions, saving you time and money on having to purchase different types of cleaning equipment. It is an electric broom, a handheld vacuum and a utility vacuum all rolled into a single package. The handheld part easily detaches from the main system, enabling you to clean the drapes, cushions, upholstery and small messes, or even your car. Use it as a utility vacuum to pick up small amounts of dirt from spilled plant pots. As an electric broom, the unit sweeps away dirt and debris on hardwood floors. Users have remarked that the suction power is not as powerful as that of a full-size vac, but the Simpli-Stik still does its job nicely. Some have used it to handle pet hair and incense and it does fairly well. Comparing it to a full-size upright is not being fair, since this unit is after all, just an electric broom. It is not designed to pick up really heavy messes and spills or viscous substances, as it is geared to be a quick-mess picker upper. It won’t handle large dirt and debris and certainly won’t measure up to the suction capability of a full size, but the unit does what it is engineered to do: quick mess pick up. Providing a one-step solution for easy and convenient cleanups, the Dirt Devil Simpli-Stik is a versatile device that lets you clean around the home quickly while ensuring sustained power thanks to its corded configuration. Unlike cordless units, this corded model provides steady suction so you can handle dirt and debris without worrying about reduced power. Geared for cleaning small living spaces, the innovative machine can handle cleaning of hard floors as well as rugs. Detaching the hand-vac unit is easy so you can remove dust and dirt including crumbs on above floor areas such as shelves, furnitures, countertops, drapes and upholstery. You may even use the hand-vac system to clean your car. The onboard crevice tools provide easy reach into tight spaces, letting you clean around furniture, in corners and along the edges of electronic items. The cleaning tools also enable you to clean between couch cushions and along baseboards for edge-to-edge handling of dirt in different areas of the home. The stick vacuum has a lightweight design that enables easy transport from one location to another. Use the unit from the first to the second floors without worrying about carrying an overly bulky piece of cleaning equipment that you have to drag around from room to room. Thanks to the bagless configuration, the vacuum cleaner has no bag that just adds to its weight. It also means no bags to replace periodically, saving you money. At just 3.8 pounds, the Simpli-Stik is a delight to carry around and won’t weigh you down as you go. When you have finished cleaning one area, you can go to clean another by simply picking up the unit via the ergonomic handle and carrying it to the next room. Unlike a full-size vac, this unit does not come with a large dirt canister that needs to be lugged around with the machine. It will provide good cleaning results despite its light weight. This stick vacuum is quite easy to use. Providing multi-purpose cleaning, it has an easy-empty dirt cup that you can just position over a rubbish bin when full to empty it of collected dirt. Enjoy effortless mobility with the smoothly rolling wheels that enable you to move the machine over the floor without having to carry it. The on/off switch enables you to turn the machine off without having to unplug it from the outlet. The unit won’t eat up a lot of closet space, as it only measures 7 inches by 9 inches by 40 inches. The cord wraps around the two plastic hooks, one on the handle and one on the detachable unit, enabling you to coil the cord neatly on the machine. The filter can be rinsed clean, so the machine can be used next time without any issues of loss of power due to clogging of its components. Great for both rugs and hard floors, the stick vacuum is outfitted with a 1.25-amp motor that provides just enough power to get the cleaning done. 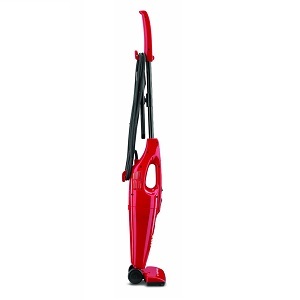 It offers dependable quality with a solid build and great cleaning capability. It does a good job of cleaning and has been proven to be pretty good at picking up pet hair. Buyers can also expect excellent customer support from the manufacturer, who provides a one-year limited warranty as a commitment to total quality and reliable after sales service. The Dirt Devil Simpli-Stik is a remarkable machine that works hard to deliver the kind of performance you expect from a stick vacuum, with no frills and no fussy features that will only prove to be useless in the long run. Just honest-to-goodness pick up of dirt and debris around the home.